The future of NASA’s Kepler space telescope mission is in doubt, NASA announced yesterday, as it suffered a failure of a second reaction wheel, losing its ability to precisely point to look for planets orbiting other stars. Reaction wheels enable the spacecraft to aim in different directions without firing thrusters, and the spacecraft needs at least three of the four wheels working to provide the ability to point precisely enough to continue the mission. But, as we pointed out in our article yesterday, the Kepler team said there are still possibilities of keeping the spacecraft in working order, or perhaps even finding other opportunities for different science for Kepler, something that doesn’t require such precise pointing abilities. Space expert Scott Hubbard has provided additional insight on the possible ways that NASA could bring the spacecraft back online, and what planet hunters will do next if that’s not possible. Hubbard is a consulting professor of aeronautics and astronautics at Stanford’s School of Engineering, and served as director of NASA Ames Research Center during much of the building phase of the Kepler space telescope. He also worked on the project alongside William Borucki, the Kepler science principal investigator at Ames and the driving force behind the effort, for the decades leading up to formal approval of the mission. Q: How big of a loss will it be if the Kepler space telescope can’t be repaired? Hubbard: The science returns of the Kepler mission have been staggering and have changed our view of the universe, in that we now think there are planets just about everywhere. It will be very sad if it can’t go on any longer, but the taxpayers did get their money’s worth. Kepler has, so far, detected more than 2,700 candidate exoplanets orbiting distant stars, including many Earth-size planets that are within their star’s habitable zone, where water could exist in liquid form. Kepler has done what the program managers said it would do, and that is to give us an inventory of extrasolar planets. It completed its primary observation phase, and had entered its extended science phase. We’re already in the gravy train period – there’s still a year and a half’s worth of data in the pipeline that scientists will analyze to identify other candidate planets, and there will continue to be Kepler science discoveries for quite some time. Q: How might NASA engineers go about getting Kepler functional again? Hubbard: There are two possible ways to salvage the spacecraft that I’m aware of. One is that they could try turning back on the reaction wheel that they shut off a year ago. It was putting metal on metal, and the friction was interfering with its operation, so you could see if the lubricant that is in there, having sat quietly, has redistributed itself, and maybe it will work. The other scheme, and this has never been tried, involves using thrusters and the solar pressure exerted on the solar panels to try and act as a third reaction wheel and provide additional pointing stability. I haven’t investigated it, but my impression is that it would require sending a lot more operational commands to the spacecraft. Q: If neither of these options works, Kepler is still an amazing space instrument. Could it conduct other types of experiments? Hubbard: People have asked about using it to find near-Earth objects, or asteroids. Kepler carries a photometer, not a camera, that looks at the brightness of stars, and so its optics deliberately defocus light from stars to create a nice spread of light on the detector, which is not ideal for spotting asteroids. Whether or not it could function as a detector for asteroids is something that would have to be studied, but since it wasn’t built as a camera, I would say that I’m skeptical. That said, certainly between Ames Research Center and the Jet Propulsion Laboratory, they’ve got the best people in the world working on it. Q: What’s next for exoplanet hunters? Hubbard: As I said earlier, there is still a year and a half’s worth of data in the pipeline to analyze to identify candidate planets, so there are still discoveries to be made. 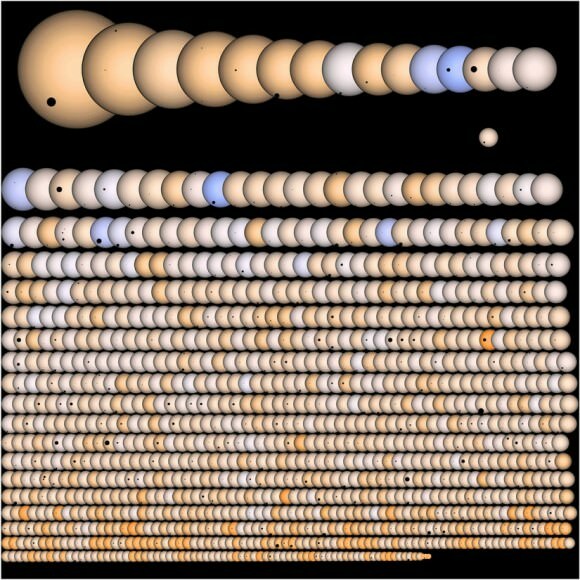 It’s important to make clear, though, that in the original queue of missions aimed at finding life elsewhere, a mission like Kepler was a survey mission to establish the statistical frequency of whether these planets are rare or common. It lived the length of its prime mission, and was extremely successful during that time at achieving this goal. It has paved the way for additional missions, such as TESS – Transiting Exoplanet Survey Satellite – and TPF – Terrestrial Planet Finder – which will continue the search for Earth-like exoplanets in the near future. Let’s get that James Webb up there STAT! Truly. I’m glad they’re working on getting it right, but I’m still worried about launch. Once it’s up there I’ll be happy. But remember that the Webb is an infrared instrument, not at all useful as a planet finder. What I’d like to know is: (on the understanding that these ‘reaction wheels’ are in fact gyroscopes), why don’t the engineers design additional spares into the telescope? We had the same problem with Hubble when they were replaced in a repair mission. The spares could be run at a tick-over speed until needed then run up to full speed when a primary gyroscope fails? Or, the primary and secondary gyroscopes could both be run, in parallel, at half speed until one fails, then the remaining one could be run up to full speed. Also, there’s no reason you couldn’t have a third layer of redundancy as well. Ok; all this would add to the launch weight (and cost) of the telescope but nowhere near as much as the cost of a repair mission or indeed, the loss of the whole telescope. There was a spare 4th gyro designed in. It failed. There are limits to redundancy in any design. I’m sure with 20-20 hindsight they woulda added a 5th gyro. I believe that a reaction wheel rotates on a fixed axis, while a gyroscope is a similar wheel mounted in a gimbal that allows its axis of rotation to be changed. Fixed reaction wheels are, I believe, used in smaller satellites where the inclusion of a gyroscope is not practical. While it is frustrating to have such a valuable instrument fail, I am sure the number of reaction wheels included was a carefully-considered design choice. Designing such an instrument is always a balancing act, and weight and space concerns often dominate. There is also the issue of cost. What program would you have had NASA cut to fund the over-engineering of Keppler? If anyone can figure out a way to keep Kepler in operation, it’ll be the engineers at Ames and JPL. Those people are amazing. Yea, I agree. They’re superstars! I bet what they’ll do is let the Kepler ‘s field of view drift across the sky. After a certain period it’ll drift back to the same patch of sky. They’ll then develop the software to compensate for the drift. What about a robotic repair mission? We couldn’t send people to do it because of the orbit, but an autonomous or semi-autonomous mission doesn’t seem impossible. And if we are lucky TESS too will get an extension after its nominal 2 year mission and there will be some Earth analogs lurking near Earth that it can find. TESS has a lot less statistical likelihood of netting one (smaller search volume), but if it does those are also much easier to look for life on. I’m a bit surprised by Hubbard’s description. It isn’t exactly true that Kepler achieved what the program managers wanted it to do, as I understand it. A large, perhaps primary, goal for Kepler was to look for Earth analogs, Earth sized terrestrials in the habitable zone of Sun sized stars. That was why Kepler’s nominal mission was designed for 3.5 years in the first place, covering year long orbits with the required 3 transits. Else it would have sufficed with 1-2 years to capture more of the already known hot Jupiter orbital zone and extend it with a hefty amount. And when it turned out that the Sun was a slightly calmer star than the average at that size, something that only Kepler was in the position to find out, it was predicted that several years would need adding to achieve looking for Earth analogs. At the time it was claimed 7 years, but it is a statistical issue (signal among noise), and I understand the later numbers were 5.5 years. At 4 years we have Borucki claiming that he is “optimistic that the data we have we’ll be able to accomplish Kepler’s mission of finding another Earth.” And since Kepler has found Mars sized terrestrials, it can only mean that he believes the pipeline and improved methods has a fair chance resolving Earth analogs. The other scheme, and this has never been tried, involves using thrusters and the solar pressure exerted on the solar panels to try and act as a third reaction wheel and provide additional pointing stability. That is interesting! I feel I have read some mission that had to try that (and possibly succeeded), but I can’t find anything about it and I don’t know if it was tried in near-Earth orbits. Maybe some UT reader will know. Didn’t they use solar wind and thrusters for attitude correction on Hayabusa when it lost two of its reaction wheels?